2 How to treat rash under breast? Intertrigo or Rash Under Breast is an irritation that often develops under the breast, where the skin turns red and itchy. It may be a version of irritant dermatitis. In most occasions, it involves pain and sometimes, also blisters. On top of that, the area becomes inflamed and scaly and further use of constricting fabric like bras, particularly, ill-fitting ones, do not help the issue. This is mostly because rashes tend to develop in hot and humid climates. Accumulation of sweat, lack of contact with air and excessive heat are often the primary causes for rashes. The growth of germs in the moisture laden environment may further lead to yeast or other varieties of fungal infections. However, other factors like allergies or breast tissue infection due to breastfeeding may be causes as well. In most cases, overweight women or those with heavy breasts face this kind of issues because rashes are caused by friction between the surfaces of our skin. What is most bothersome is the relapsing nature of this condition. The easiest and best options are to keep the moisture off from underneath the breasts and allow sufficient air circulation. Wearing an Ill-fitting Bra: Sometimes, breast rashes have simple wardrobe based causes, like a bra with the wrong fit An ill-fitting bra can cause several health problems like bad posture, breathing issue and of course, rashes. But not only the size, but more importantly, the shape of the breast can lead to intertrigo. It is more particular in breasts that sag and use of the wrong bra end up in chaffed skin. Moreover, bras with an underwire poke the tender skin beneath the breasts and aggravate the conditions. Loose bras do not hold the breasts together, sufficiently. Fungal infections mostly occur when the skin under the breasts chafes against the chest cavity and there is no chance for the area to dry properly which leads to moisture accumulation. In this warm and wet environment, the flora of the skin begins to multiply and ends up in an irritated skin. While rashes under the breasts can be caused due to several other issues as well, some of the indications of a fungal infection are redness and swelling. Along with the intense itching, the skin may further begin to ooze. 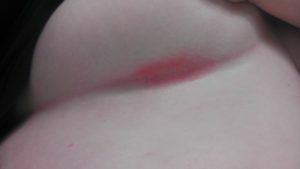 The skin ends up with dry and flaked patches and it is painfully sore. If you have diabetes or a weakened immunity, the situation becomes worse, especially, if you intake medicine that prevents the body’s natural defense against infection in general. Bacterial Infection: With the body’s natural defense mechanism working against the effects of bacteria, mostly, it fails to cause any infections. However, when bacterial infections do affect the skin, they can be quite serious if left unattended. The most common bacterial infections that affect our skin are Staphylococcus and Streptococcus. Stagnant blood flow, predominant among those with diabetes, is also caused from bacterial infections. Moreover, a bacterial infection also affects those who have AIDS or HIV. Wounded skin is more prone to catch bacterial infections. It may end up blistering with pus and further spread of the infection. You can consult your doctor for better advice. Use of anti-bacterial creams is usually recommended on a sanitized patch of skin. Allergic Dermatitis: Allergic dermatitis is caused by coming in touch with a substance and is a form of contact dermatitis. It is the most common version of immunotoxicity that usually afflicts humans. The symptoms of Allergic Dermatitis are hard to differentiate from Contact Dermatitis. Rashes or lesions are some of the initial symptoms. The rash may even begin to ooze or form a crust and end up raw, scaly or thickened. The rash might not be the only consequence of allergic dermatitis. Blisters, vesicles, and papules also are caused by this. Several substances like nickel, gold, chromium and others , when in contact with areas of our skin, cause allergic dermatitis. Excessive Sweating: Over sweating, especially, in confined areas can end up in rashes as well. Not only is the infection painful, it is embarrassing as it leads to unprecedented stink as well. Sweating is a major problem for oversized breasts as they are not exposed to air sufficiently. It is the root cause of all kinds of fungal and bacterial infection which leads us to our problem: rashes. Even though sweating is a very common experience that is necessary for the proper functioning of our body, the electrolytes and salt in the sweat form a crust under the breasts and the skin begins to break down. Allergic Reactions: Even besides Allergic Dermatitis, there may be other allergic reactions that cause the dreaded rashes under the breasts. Xerosis or drying accompanied with flaky skin and itching are related to use of harsh soaps, age, and dry climates. Excessive scratching also causes allergic reactions. Eczema or atopic dermatitis, a form of allergy, is genetic and worsens during pregnancy. Contact dermatitis is an inflammation of the skin that is caused by contact with certain fabrics, cream, lotions, etc. Detergents used to wash the undergarments may also have a detrimental effect on the skin under the breasts. Further, hives which are categorized by itchy weal, breast abscess that is the accumulation of pus in the tissues of the breast, mastitis, which is predominant in those who are breastfeeding, are pretty painful to experience. They cause red swollen patches that are warm to touch and tenderness in the general area. Moisture under the Breasts: Moist skin is the breeding ground for various infections. You should be particularly conscious of keeping the moisture and a steady air circulation. Not just sweat, any sort of moisture accumulation like left over water from your bath, or if you get soaked or drenched in rain can cause irritations. Warm areas, laden with moisture, especially those that have little chances to dry during the course of the day are prone to several yeast or fungal formations and even bacterial infections. How to treat rash under breast? The Ace Reusable Cold Compress fits the shape of the breast and retains its flexibility when it is cold. It further controls the itching and eventually heals the inflammation under the breasts. It does not require the bulky bandages or wraps that are usually used to hold the ice and can be placed on the affected are without any other layers in between. While using it, you need to freeze the product for two hours beforehand. Then apply for around 20 minutes. After usage, put it back in the freezer. That way it will be readily available in case of an emergency. You should further be careful that the temperature of the water of your bath or shower should not be too hot. Warm or cold showers are the most effective measures. Too much hot water dries up the area more than is necessary and prevents the natural oil secretion. Further, you should not scrub the area or over wash it. Unscented soaps and lotions or oil are often the best choices. Apply lotion or some oil over half dried skin and then use a blow dryer on a low setting to dry the affected area. This way, the moisture is absorbed, but the skin does not lose all the fluids. There may be several varieties of food that are allergic to your body. Some are very common afflictions while some might be personal to your metabolism. It is wiser to avoid the intake of these products. Some products like milk or dairy based items, eggs, shellfish, peanuts, tree nuts, fish, soy, and wheat may cause allergies in many people. A food allergy is caused by the overreaction of the immune system to certain intakes, deeming them dangerous for your body. Food allergies can be really risky and rashes, however, irritating they may be, are the least of the reactions caused by food. It can lead to breathing problems and rapid reduction of blood pressure and heart rate. Also known as anaphylaxis, it can even end up in death if untreated. If you have diabetes, that may aggravate the rashes. Often, sesame or mustard seeds are triggers for allergies as well. Food allergies may manifest in the form of vomiting or stomach ache, wheezing and coughing, the collapse of your circulatory system, a weak pulse, change of skin coloring, hoarse throat, dizziness, etc. To avoid rashes, you should know the foods that are allergic to your body and avoid consumption. The use of a cotton bra liner is another solution. It does not let the bras get sodden and this not only keeps the area dry but further protects the expensive material of the bra. Further, by placing a layer between the bra and the skin of the breast, it reduces the chafing and scaling of the already aggravated skin. This helps maintain the freshness of the skin. Cotton does not hold the same issues as any other material and is really comfortable against your skin. Lotions, as mentioned, should not contain too many extra chemicals that might irritate the area. Calamine lotion is a good over the counter medication that is often recommended for rashes. It is antiseptic and eliminates the bacterial formations while soothing the skin at the same time. Moreover, coconut oil is a good remedy for infections as well. If you’re really unsure as to which aloe vera gel would work the best on your skin, let me try to help you. You can apply aloe vera gel to soothe the irritated skin as well. The Amara Organics Aloe Vera Gel is particularly good for getting rid of the irritated skin. It is organic with 99.75% cold-pressed aloe vera and contains no artificial scents or color or even spirit. It has a thick consistency that absorbs easily and spreads well while the skin remains supple. Take a shower after you finish your exercise regimen. Always remember to keep the area moisturized and apply sunscreens and protective clothing. Further, you should also take a look at your laundry routine and the products used for cleaning it. Often, fabric softeners and detergents trigger an allergic reaction. Use of products made for sensitive skin is a better remedy. As I have emphasized, to maintain proper breast posture and even body alignment and to prevent rashes and infections, a proper fitting of the bra is very necessary. Tighten the bra straps to prevent sagging of the breast. Sagging of breast not only damages the shape in the long run but also causes chafing against the underside and further layering of sweat. The constant scratching against the rough material is detrimental to your infected area. The bra should be made of a sturdy material that can hold up the breast, even though using underwired bras are discouraged. The wire pokes into the tender muscle and leads to several serious issues like breast cancer and tumor. But the most important is the obvious discomfort and pain the wires cause. Bras while being tight enough should, on the other hand, fit the contour of the breast. They should not be so tight that the cup does not fit properly. The bra should further be made of comfortable cotton and not synthetic or silk. Silk causes chafing and prevents air circulation thus increasing the chances of moisture collection. Cotton is good for the skin. Not only is it softer, but it is good for getting rid of sweat to a certain extent and the porous nature is good for aeration. Organic Bamboo Nursing Pads The Organic Bamboo Nursing Pads is equipped with bamboo linings that remove the moisture from the area. It is a porous and hypoallergenic polymer that is soft and comfortable against the raw area. It is washable and thus can be reused. The bamboo fibers are soft and the pads prevent the moisture from staining your clothes as well. It comes in a laundry bag with 10 in each pack. The pads offer air circulation and do not choke the skin. The Cup care Disposable Bra Liner and Sweat Pad prevent the collection of sweat under the breast by absorbing the moisture. This is a use and throw product and has no hassle in its use. It further prevents the accumulation of fungus and bacteria, thus eliminating the odor. Each piece of the liner is capable of absorbing up to 15 ml of water. The nonwoven material is hypoallergenic as well. With 12 pieces per pack, it is suited for women with A to E cup sizes. It can be glued to the underside of the bra and is noted for the portability and lack of heaviness. While in most cases, breast rashes can be cured with over the counter medicines, it is better to consult a doctor, who can determine if the infection is fungal or bacterial. An antifungal agent is basically a drug that removes fungus causing pathogens from the host with minimum harm to the host. Topical antibiotic are available as creams or powders. A cream containing neomycin and polymyxin B is used to cure minor bacterial infections. In case, you use anti-bacterial creams without doctor recommendation, do not apply it over broken or bleeding skin. 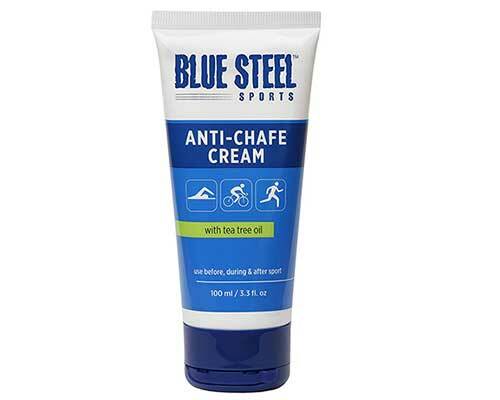 The Blue Steel Sports Anti-Chafe Cream contains tea-tree oil that prevents infections like blisters and skin rashes. The tea-tree oil is antifungal and anti-bacterial while being completely organic. It lasts on your skin for a considerable period and does not get washed off when the skin begins sweating. It does not cause any burning and is a non-greasy solution that does not linger on the applied area. Further, you do not have worry about stained clothes as you can remove it in a wash. The cream is silicone based and prevents excess moisture accumulation. It protects the area from excessive sweating and should be applied before any activities to prevent chafing. Please please try wearing a breast sling. I have had bouts with intertrigo for years, barely managing to keep it under control with medications. I bought a sling recently and my problem was alleviated almost immediately The area beneath my breasts stay dry and I no longer need for medications of any sort! What Is the Best C Section Scar Removal Cream? Copyright© Besthealthgears.com 2015 - 2019 , All Rights Reserved.